Exotic hardwoods are dense—very dense. In fact, they’re so dense that some sink in water. Brazilian hardwood density is caused by the tightly compacted wood fibers within the tree. These fibers give the wood amazing characteristics like rot, mildew, and insect resistance. These traits are fantastic, but the dense fibers also present a bit of an issue. In the past, deck builders used nails to install boards made of softwoods like cedar, redwood, pine, etc. Then with updated building codes, screws became the primary fasteners for decking. This meant that it took a little longer to install decks. On the bright side, the softness of the commonly used woods didn’t call for predrilling. This is not the case for Brazilian decking. Predrilling gives each screw a head start. It breaks the dense wood fibers, allowing the screw thread to go through the board without causing it to split. 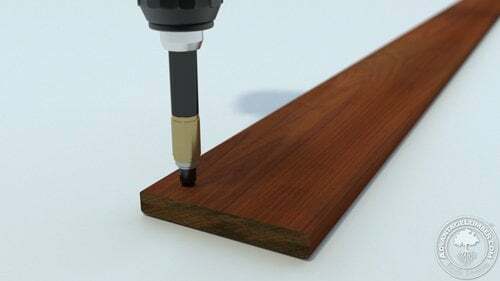 This is the importance of predrilling, and why you can’t just take a screw and insert it in a piece of Brazilian decking. Unless you want to ruin your beautiful decking before you even get a chance to enjoy it, make sure your contractor knows his way around Brazilian decking. If you’re doing the job yourself, there are tools that can speed up the process like the DeckWise Drill & Drive. Building your deck correctly will reward you with a stunning outdoor living space that’ll last for decades.